Game variables are used to store information in a running game. This information could be anything – usually the player’s progress in the game (like status of quests or solved puzzles). But that’s not all, you can even create whole new systems using variables (like a calendar system). The key (or name) of the variable is used to identify it. Please note that variable keys can’t have an empty space! E.g. ‘Final Quest’ isn’t allowed, use ‘Final_Quest’ instead. The value stores the information assigned to the variable key. Game variables are saved in save games – you can change if (and which) variables will be saved in Menus > Save Game Menu. Local game variables are only available in the event system and formulas. As soon as the event/formula has finished, the variable will be gone. Usually you’d use them to keep track of something that’s only needed within an event or formula. Formulas called by an event (directly or through an underlying battle action) will share the local variables with the event. Global game variables are available everywhere and any time. They’ll be saved with a save game and are persistent throughout the game. Object game variables are bound to game objects in your scene using an Object ID. You can use them to store information on objects, like keeping track how often you talked to an NPC. They’ll also be saved with a save game and are persistent throughout the game. Object game variables require an already existing game object with an Object Variables component attached to access them. Instances of abilities, items or equipment can have game variables attached to them. They’re accessible through the Selected variable origin in events and formulas, when they where previously set as Selected Data. You can learn more about selected data in this how-to. These variables will also be saved with save games (if the instances of the abilities, items and equipment are saved, e.g. with the player combatant’s abilities/inventory). 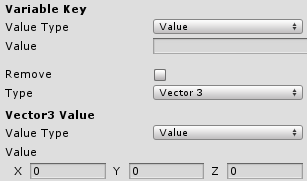 Each variable key can hold one value of each type. If you store another value of the same type into a variable, the old value will be lost. String values can store all kind of information – a string is simply a text. You can use them to remember the name of a scene, change a combatant’s name and many other things. When creating complex quests, it can be useful to store some information in a string variable and display or check it at a later time. Bool values are simple triggers. You can use them to simply store that something happened, like an event that has been performed. Float values can be used for complex operations – a float is a number and allows using decimal numbers. You can use them in formulas or even change them using mathematical operations. When building complex systems (like a calendar), this is what you’ll most likely use. Vector3 values can be used to store positions. They can be used in events or scene targets to spawn or move game objects at those positions. Game variables can be changed by multiple things, e.g. the event system, using an item or defeating an enemy. The settings for changing game variables are always the same. Depending on which type of variable you want to change, the settings differ a bit – but some base settings are still valid for all game variable types. The text defined in Text is the key (name) of the variable. Text is the key of a game variable (string) which holds the key of the variable that will be changed. Text is the key of a PlayerPrefs (string) variable which holds the key of the variable that will be changed. See the Unity® documentation for details on PlayerPrefs. The name of the current scene. The game variable will be removed. This will remove all values assigned to the variable key. If disabled, the variable will be changed/set. A string value will be changed. A bool value will be changed. A float value will be changed. A Vector3 value will be changed. Depending on the type selection you’ll have different settings for defining the value. The text defined in Text is the value that will be used. Text is the key of a game variable (string) which holds the value that will be used. Text is the key of a PlayerPrefs (string) variable which holds the value that will be used. The name of the current scene is used as value. The game variable (bool) will be set to the value defined here (either true or false). Adds the value to the current value of the variable. Subtracts the value from the current value of the variable. Multiplies the current value of the variable with the value. Divides the current value of the variable by the value. Uses the modulo operator, current value of the variable % the value. The current variable value to the power of the value. The current variable value is used in a logarithmic calculation with the value as base. Sets the current variable value to the value. The number defined in Value will be used. Variable Key is the key of a game variable (float) which holds the value that will be used. 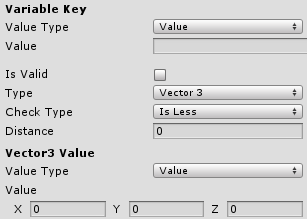 Variable Key is the key of a PlayerPrefs which holds the value that will be used. Is Int defines if an int or float PlayerPrefs will be used. The result of the formula selected in Formula is used as value. The formula uses the player combatant as user and target. No rounding will be performed. The value will be rounded up (e.g. 10.2 will become 11). The value will be rounded down (e.g. 8.9 will become 8). The value will be rounded normally (e.g. 5.4 will become 5, 8.7 will become 9). The Vector3 defined in Value will be used. Variable Key is the key of a game variable (Vector3) which holds the value that will be used. The scene position of the current scene (or (0,0,0) if not set). You can set a scene positions in the event system. The current position of the player. Game variables can be checked on multiple locations in ORK Framework, e.g. the event system or requirements. The settings for checking game variables are always the same. Depending on which type of variable you want to check, the settings differ a bit – but some base settings are still valid for all game variable types. Text is the key of a game variable (string) which holds the key of the variable that will be checked. Text is the key of a PlayerPrefs (string) variable which holds the key of the variable that will be checked. If disabled, the result of the the check must be invalid. A string value will be checked. A bool value will be checked. A float value will be checked. A Vector3 value will be checked. Depending on the type selection you’ll have different settings for defining the value that will be checked. Checking a game variable (bool) doesn’t require any other settings, the Is Valid setting defines if the value of the variable is checked for true or false. The current value of the game variable (float) is equal to the defined value. The current value is less than the defined value. The current value is greater than the defined value. The distance between the current value of the game variable (Vector3) and the defined Value (Vector3) is equal to the defined distance. The distance is less than the defined distance. The distance is greater than the defined distance. The distance that will be used for the check. The distance between the current value of the game variable (Vector3) and the defined value (Vector3) will be checked against this distance. You can also change and check game variables via code. Returns the value of the game variable (string) key. Returns the value of the game variable (bool) key. 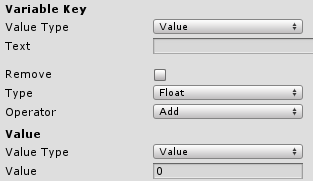 Returns the value of the game variable (float) key. Returns the value of the game variable (Vector3) key. Removes all values of the game variable key. Sets the game variable (string) key to value. Sets the game variable (bool) key to value. Sets the game variable (float) key to value. Sets the game variable (Vector3) key to value. Changes the game variable (float) key by value, using the operator op. All checking functions return a bool – true if the check is valid, false otherwise. 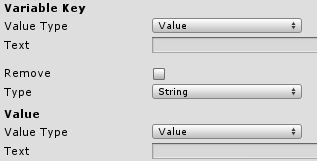 Checks if the game variable (string) key is set to value. Checks if the game variable (bool) key is set to value. Checks if the game variable (float) key is set to value. Checks if the game variable (Vector3) key is set to value. 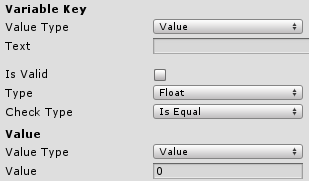 Checks the current value of the game variable (float) key against value using the check type. Checks the distance between the current value of the game variable (Vector3) key and the Vector3 value against distance using check type. The distance is equal to the defined distance.